Guillermo Couture, a master tailor of the highest tradition, crafts custom dresses and gowns, bespoke men's suiting, alterations, and reproductions of designer clothes for New York's discerning ladies and gentlemen. 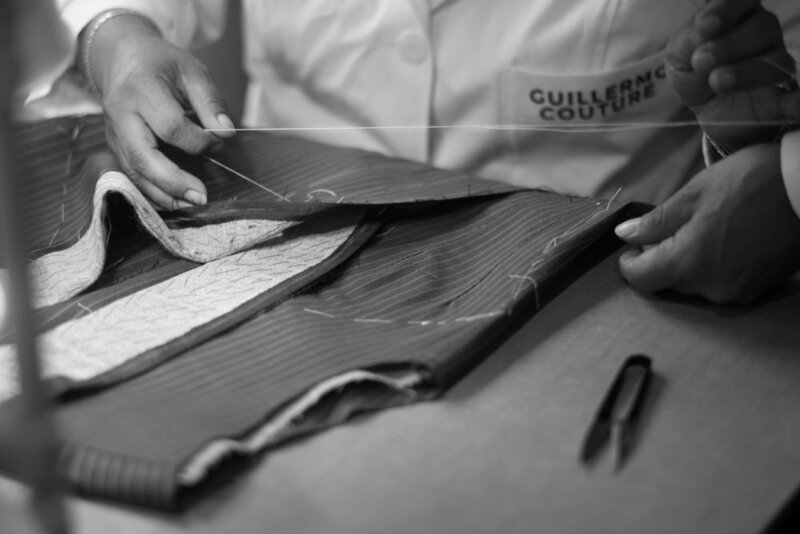 For more than 30 years, clients have relied on Guillermo Couture for the best tailoring the human hand can make. Whether you are seeking advice on a custom dress, reproducing a garment, commissioning a bespoke men's suit, or a wedding gown; our client managers and cutters have the expertise to meet your every need. When appropriate, Guillermo Molina or his team will arrange to visit your residence or office. Thank you for your interest in Guillermo Couture. We will reply within one day, excluding weekends and holidays. If you require prompt assistance, please telephone us any time at +1 (212) 366 6965 or +1 (212) 366 6964 or email us directly at gc@guillermocouture.com. The gown in the background photograph was designed and made by Guillermo Couture for a client attending a summer occasion in Valencia. Clients continue to commission variations of our original Valencia Dress, often in darker colors for evening occasions. Copyright © 2017 Guillermo Couture.